Israeli soldiers abducted, on Wednesday at dawn, at least eighteen Palestinians from their homes, in several parts of the occupied West Bank, the Palestinian Prisoners’ Society (PPS) has reported. The soldiers invaded dozens of communities across the occupied West Bank, before storming and ransacking homes, and interrogated scores of Palestinians while inspecting their ID cards. The army also installed roadblocks on many areas in the occupied territory, before stopping and searching dozens of cars, and interrogated the residents while inspecting their ID cards. The PPS added that children and former political prisoners, are among the abducted Palestinians. 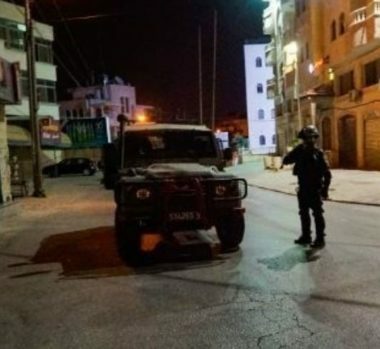 One of the Palestinians, identified as Zeidan Saleh Hawashin, from Jenin refugee camp, was abducted while crossing Barta’a military roadblock, southwest of the northern West Bank city of Jenin. Rami Shehada Shebani, 22, Arraba, Jenin. Zeidan Saleh Hawashin, 19, Jenin refugee camp, Jenin. Adnan Ahmad al-Hosary, (former political prisoner), Tulkarem refugee camp, Tulkarem. Mosab Adnan al-Hosary, (former political prisoner), Tulkarem refugee camp. Ahmad Matrouk, Tulkarem refugee camp. Hussein Howeidi, Tulkarem refugee camp. Hasan Howeidi, Tulkarem refugee camp. Ahmad Abu Jamous, Tulkarem refugee camp. Hatem Fuqaha’, (former political prisoner), Kafr al-Lubbad, Tulkarem. Anas Fadel, Askar refugee camp, Nablus. Ahmad Mustafa Abu Leil, 15, Askar refugee camp. Nidal Safwan Salim, 16, Azzoun, Qalqilia. Maan Nayef Badawi, 15, al-‘Arroub refugee camp, Hebron. Mo’taz Abu Zneid, Doura, Hebron. Rezeq Rayyan, (former political prisoner), Qarawat Bank Hassan, Salfit.